Work during these modern times has changed much since the time of the knights and kings. Work is no longer done solely during the day but is now legally done during the wee hours of the night and dawn. 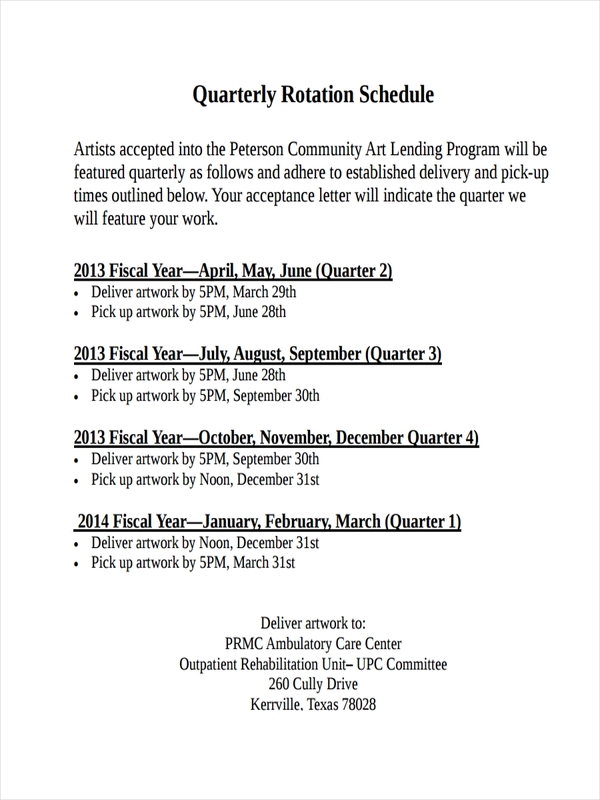 An employee work schedule is drawn out to specify what needs to be done during the time of work. As work is already made twenty-four hours a day specially in a manufacturing set up, schedules have to be rotated in order for workers to adjust to different work factors involved. 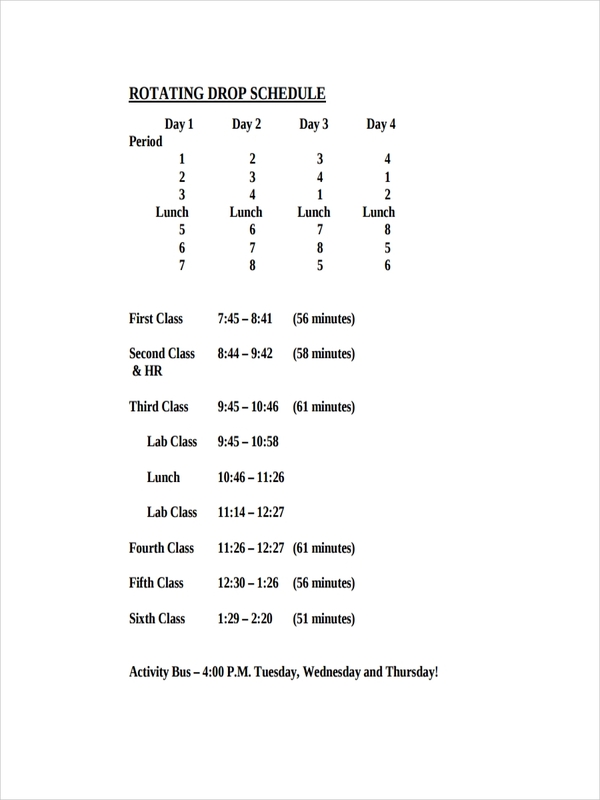 Schedule examples are made available in the page to provide further information. 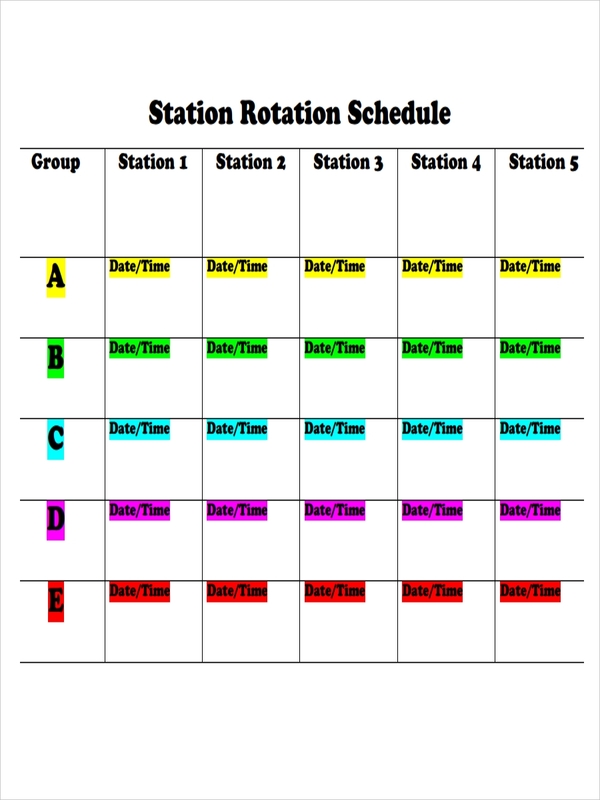 What Is a Rotation Schedule? 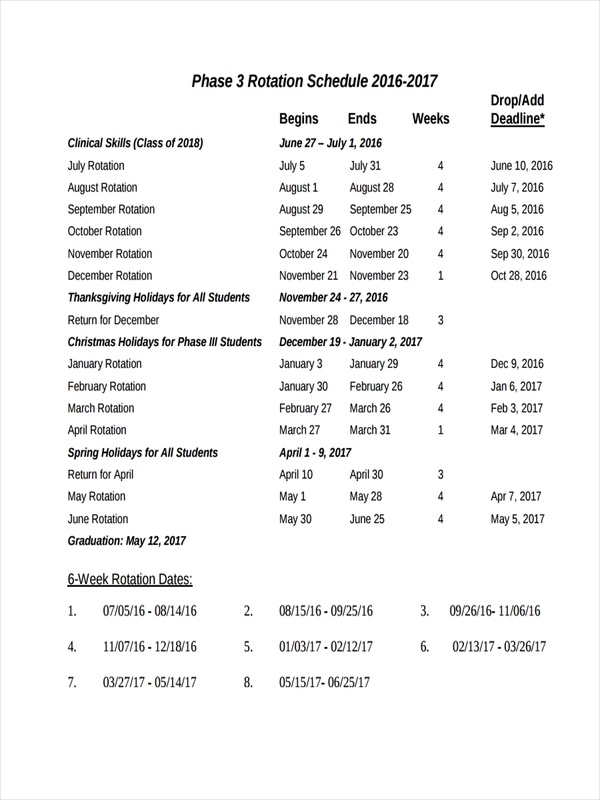 Before discussing what a rotating schedule is, let us define the opposite of a rotation schedule: a fixed sample schedule. A fixed work schedule is the traditional schedule of 9:00 a.m.–5:00 p.m. work day. A rotation work schedule, on the other hand, involves work outside of the traditional time of work. It may involve night shift, early morning shifts, and rotational shifts. What Professions have Shift Work? 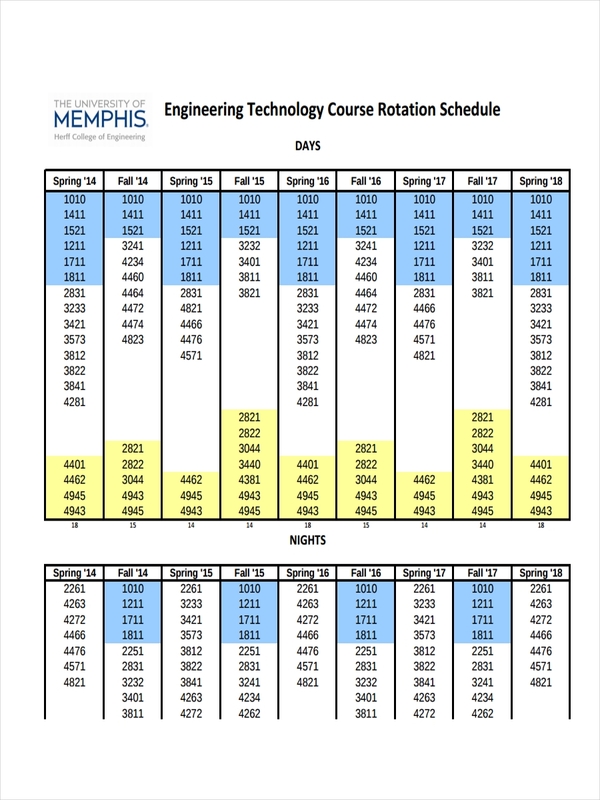 A rotational time schedule is based heavily on the physical and mental requirements or demands of the job. Most shift workers belong to service occupations namely protective work (police, security, firefighters), transportation (public and private), healthcare (hospitals and clinics), and food preparation and service (24-hr restos and shops). 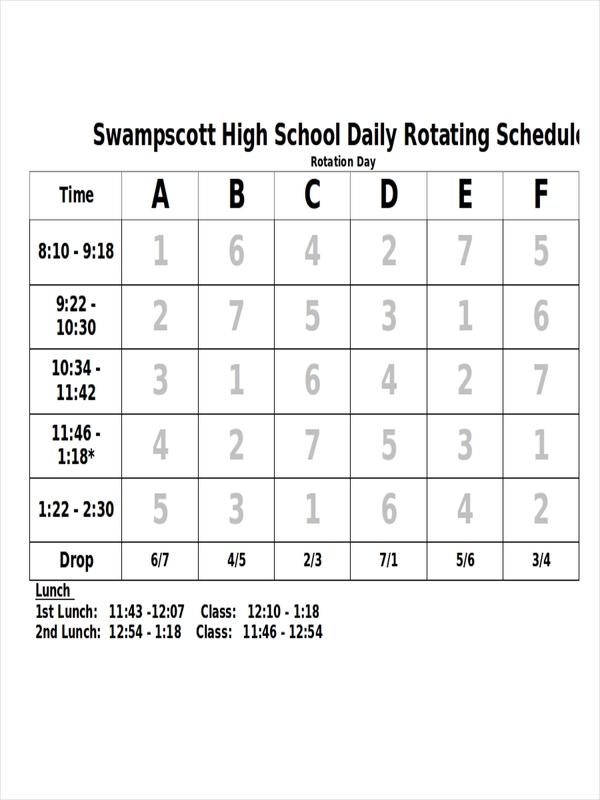 Samples schedules such as shift schedule examples exist in the page in order to help you in making a rotation schedule of your own. Make sure to download the sample by clicking on the download link button beneath the sample. Some professionals really have no say in the matter and are left with no choice like hourly shcedules. Shift schedule is part of the nature of the job. Nurses, police, security guards, and firemen have had this type of schedule for centuries. Other people regard it as a matter of personal choice. Others opt to have shift schedules to accommodate time for family and children. Believe it or not, some people have a better harmonious arrangement with their family being in shift schedules rather than a normal one. There certainly are abnormalities to the human gene pool and some work considerably more efficient at night compared to the day. Night creatures, they’re called. Schedule examples in Excel and work schedule examples in the page contain further information regarding the making of a shift schedule.